Here’s an illustrated step-by-step guide that teaches you how to wear a Sari – India’s national dress for females – one of the most elegant attires a woman can adorn…Two essential parts of attire, that go along with the Sari, need to be chosen carefully to compliment the Sari. These are:A petticoat which is a waist-to-floor garment, tied tightly at the waist by a drawstring. 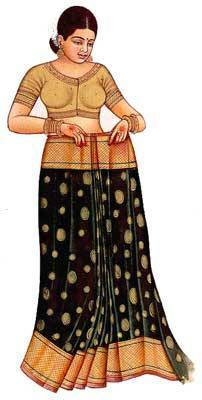 The petticoat color should match the base sari color as closely as possible. No part of the petticoat, of course, is visible outside the Sari, after having worn it. A blouse which needs to be tight-fitting and whose color needs to be chosen keeping the look of the sari in mind, can be short sleeved or sleeveless, with a variety of necklines. The blouse ends just below the bust. 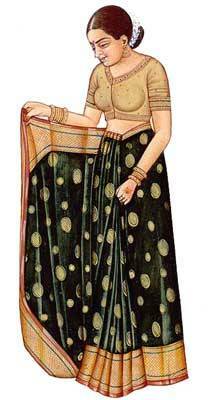 Start wearing the sari by tucking its plain/upper end into the petticoat, at a position which is a little bit to the right of the navel. Make sure that the lower end of the sari should be touching the floor, and that the whole length of the sari comes on the left-hand side. Now wrap the sari around yourself once, with the sari now coming back in the front, on your right side. Neatly tuck the pleats into the petticoat, at the waist, slightly to the left of the navel, in such a manner that they open to your left. Drape the remaining fabric around yourself once more left to right, and bring it round your hips to the front, holding the top edge of the sari.